The closest resort to SeaWorld. Paradise Point is a 44-acre island escape featuring bungalow-style guestrooms amidst tropical gardens- meandering lagoons and one mile of beach. All accommodations are conveniently located on the ground floor and options include waterfront suites and connecting rooms ideal for families and groups. 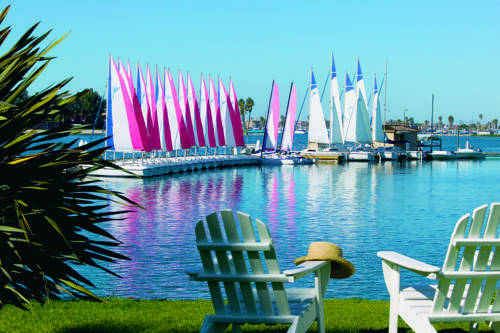 This Four-Diamond resort offers five pools; five dining venues; a marina; luxury spa; beach bonfire pits; surf academy and water taxi with seasonal service to SeaWorld and local beaches. Secluded yet centrally located Paradise Point is just minutes from top attractions including Balboa Park; Old Town; the San Diego Zoo and Gaslamp District. Tidal: Tidal offers a thoughtful selection of local seafood and craft beverages. Barefoot Bar and Grill: This legendary bayside restaurant offers a more casual atmosphere. Tropics Cantina: Tropics Cantina serves authentic fresh Mex pool side.